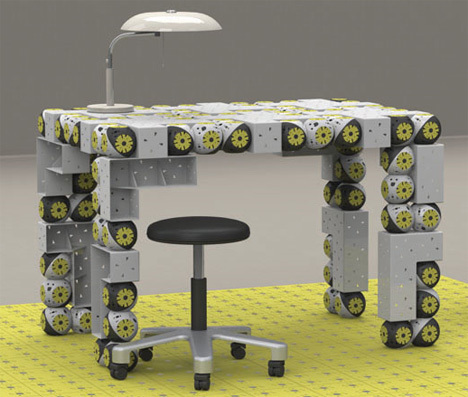 Modular Self-Assembling Robots Will Replace Furniture? Picture yourself just a few years in the future. It’s evening and you’ve just finished dinner. When you finish washing the dishes in the kitchen and walk into your den to relax, a horde of small robots scoots in front of you and assembles itself into a comfortable sofa and footrest. You settle into the newly-assembled furniture and turn on the TV. After your favorite show is over, you grab your laptop and walk to the other side of the room, where your group of autonomously-moving robots has disassembled itself from the couch configuration and is swiftly rearranging into a small desk. 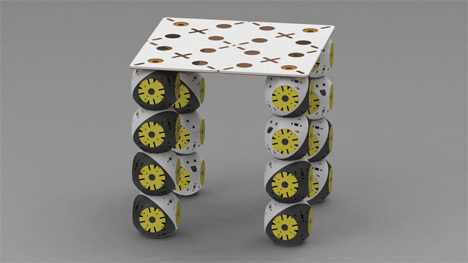 You set your laptop down, spend an hour or so surfing and updating your statuses, then hit the bedroom for some rest, knowing that when you get up your legion of rolling minions will be waiting for you – this time shaped as a little breakfast table and chair. Self-assembling robot furniture has been proposed in the sci-fi universes before, but there hasn’t been an abundance of real-world development…until now. Swiss group BioRobotics Laboratory is developing a line of bots that self-assemble in different configurations depending on your needs and their location. Rather than traditional furniture that, for the most part, stays in one place and has to be picked up if you need it to do something else, the Roombots roam around the house assembling into whatever you need them to be at that moment. Each Roombot moves independently and communicates with the other ‘bots to figure out where each of them should be. The components all connect to each other and can move, bend, flex and rotate in every direction. There are even passive non-moving modules and special universal hinges to make sure that every type of furniture need can be accommodated. Now if Biorobotics Lab can figure out how to make the Roombots bring snacks along with them when they enter the room, we’ll be all set for a future full of loafing. See more in Robotics or under Technology. September, 2010.